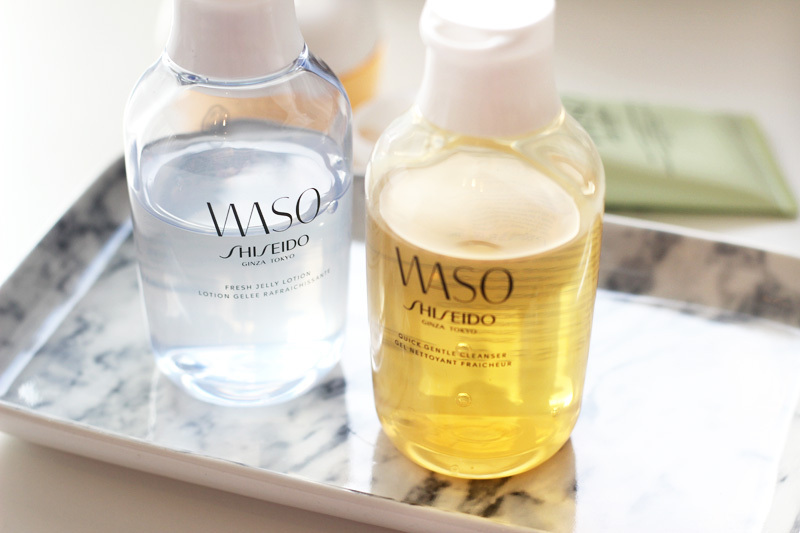 A month or two ago I came home to exciting Shiseido mail. 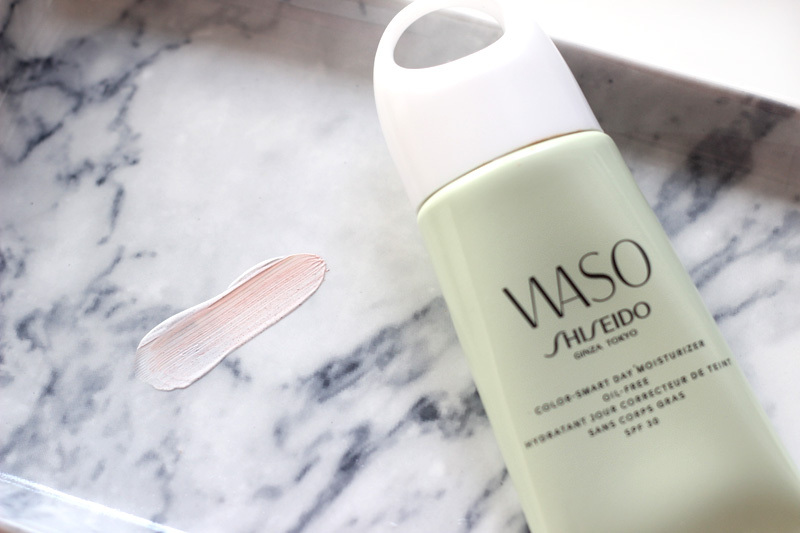 You know how much I love Japanese beauty, and Shiseido is one of those top notch quality Japanese brands that have gained a lot of popularity across the globe. 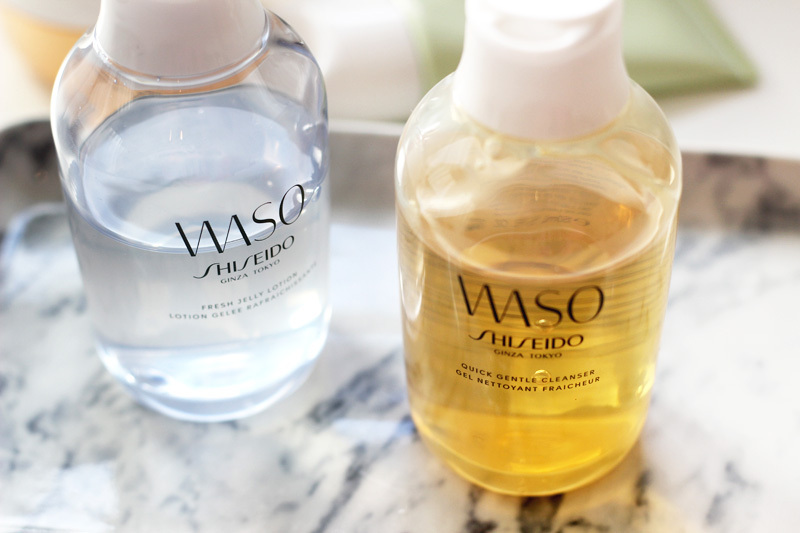 I hadn't yet tried their skin care, but when I saw the new minimalist Waso range pop up on social media I was already intrigued by the name (Waso combines two words: 'WA' meaning a Japanese sense of peaceful and harmony, and 'SO' meaning inspiration, idea and thought), refreshing packaging design and the Japanese food tradition philosophy that goes behind the products: Washoku. Washoku stands for the Japanese food tradition, which has been proven to be one of the healthiest diets worldwide. And one of the tastiest as well - ever since visiting we've been cooking Japanese dishes very often! 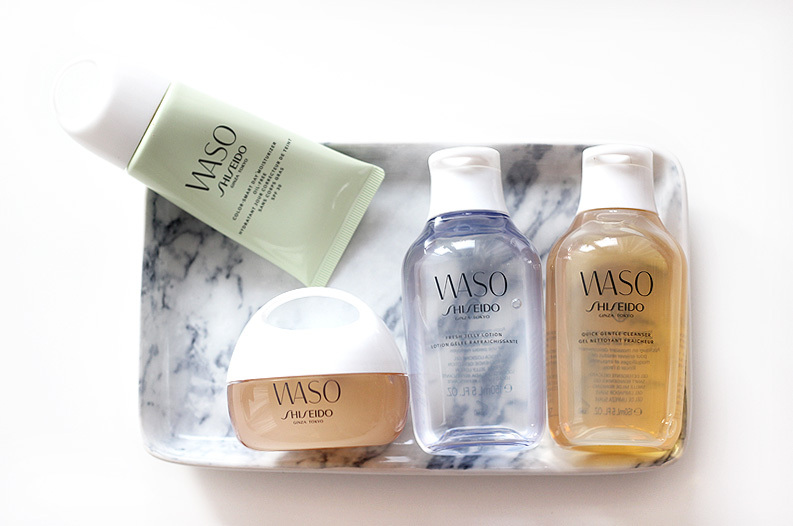 The Waso range only contains seven products, all targeted towards a young skin. I'm thirty and love the range, so I think it's also perfect for whoever struggles with acne or oily skin areas. The products contain key ingredients like carrot, loquat, honey, tofu and white jelly mushroom; which all tackle a specific skin care problem. The Fresh Jelly Lotion is a clear gel-to-liquid that delivers a burst of hydration to skin. I use it just like I would a serum: after cleansing and toning, and before moisturising. It's formulated with white jelly mushroom which works much like hyaluronic acid does, but more effectively since it has been found to have smaller particles that penetrate the skin easier. This might be my favourite product out of the four that I've tried from the range. I love how economic it is too: a bottle holds 150ml and goes a long way if you use it as you would a serum. The Quick Gentle Cleanser does what it says on the bottle: it is a gentle gel-like cleanser that does not make my skin feel parched after cleansing. It foams up a little already without water, and lathers up lightly when adding water. It's formulated with honey and royal jelly (a substance secreted by worker bees) extracts - two skin care ingredients that have grown super popular in Asian skin care over the past few months. I have a couple of sheet masks focusing on those exact same ingredients laying around and they always make my skin look plump and happy after using them too. The Clear-Mega Hydrating Cream is another super interesting product in the range: this is a clear gel that melts onto your skin as you apply it. This one is formulated with carrot cells which are high in beta-carotene so offers great antioxidant properties, but also high in water to keep skin looking moisturised. I use this one as a night time moisturiser after cleansing, toning and any serums or treatments I might want to add. 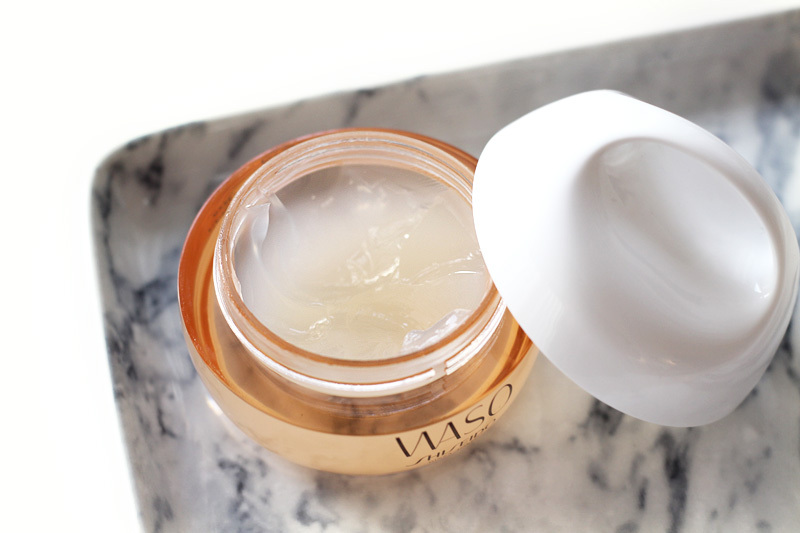 It makes my skin feel very comfortably moisturised all evening & night through. And it also makes it feel so so so soft! The last product from the range that I have tried is the Color-Smart Day Moisturizer Oil Free with SPF30. This one is very clearly formulated in a way that won't suit drier skin types (there is also a version for dry skin in a pink tube), which also makes it just about perfect for oily skin types. The moisturiser comes out as a white speckled cream, but reveals to have pigment hidden inside that will blend in with your own skin tone as you work the product into your skin. As I have quite pale skin I was worried that the colour would turn out too dark, but I was happy to find that the shade really does work well on me. It's a brighter pink than my own yellow-tinted skin tone has a brightening effect I love. The coverage is just enough to be quite natural but still even out my complexion, so I've been wearing it on make-up free days as well as underneath makeup. I have combination skin that is a little more on the oily side during summer, but also gets a little drier during winter; however my skin has been loving it in both conditions.